Access to information at the point-of-sale: With mobile merchandising, reps can have immediate access to a multitude of information, from category and product presentation to detailed store data. This means knowing the store manager's name or accessing the location's specific plan-o-gram without having to go through paperwork or making phone calls. Instead, mobile merchandising apps give instant access to these critical pieces of information with just a couple of taps and swipes. No more admin people or tasks between reps and management: With a "legacy" merchandising system in place, throughout their workday, field reps collect merchandising information at the POSs, then either file reports online or send their paperwork to a person who will do it. This extra step means that information can get lost or misread, and that a lot of time has passed since the potential detection of a problem and its resolution. 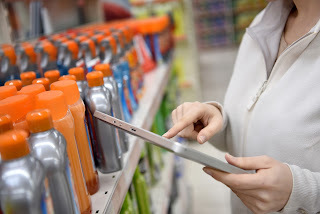 Mobile merchandising eliminates the intermediaries between data collection and analysis, so category managers can be on top of what is happening at the points-of-sale. Quality and precision of information collected: A top-of-the-line mobile merchandising system allows decision makers to design custom forms and request the exact information needed, with little room for guessing or interpretation errors. It is also possible to capture photos and signatures and the data will be GPS- and time-stamped, making sure it was collected at the right place and time. Want to see a mobile merchandising system in action? Watch the below video and schedule a live demo today! Learn more about VisitBasis Mobile Merchandising and sign up for a free trial.